The FBI says it wants a golden key to access Americans’ phones. Now, politicians are pushing back. A top FBI official, Amy S. Hess, said at a House Oversight Committee hearing on Wednesday that encryption of phone data is limiting the FBI’s ability to spy on communication. She said law enforcement needs a way to access smartphone content in order to stop criminals and terrorists, suggesting that the FBI have access to keys that can unlock customers’ data. But in a rare show of unity, Congressmen almost universally fought back against that idea. U.S. Representative Rod Blum, a Republican from Iowa, likened that to homebuilders putting a camera in every new house — and telling people to blindly believe they won’t be turned on later. This hearing is the latest sign of a potential turning point. After the Sept. 11, 2001 terrorist attacks, a nation in turmoil passed security-focused laws like the Patriot Act that widely expanded the use of secret surveillance. But sentiment is starting to shift in the other direction. In 2013, we learned that government spies are collecting emails, phone records and tapping into phone and video chats. Tech companies, feeling betrayed, are encrypting more of their own communication — and offering that to customers too, guarding them from hackers, cybercriminals and government spies. 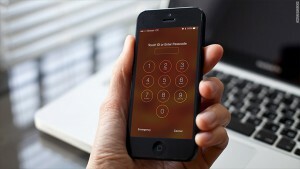 Apple (AAPL, Tech30) has enhanced the security of iPhones by requiring a person’s password to unlock his or her phone. Google (GOOGL, Tech30) allows Android users to encrypt their phones — but not by default. When a phone is encrypted, law enforcement can’t secretly search someone’s phone remotely. Police need the physical device and a warrant. And — theoretically — detectives need someone’s cooperation to go through their device. But in reality, cops can get into your phone if they grab it. Local police in Fort Lauderdale and Orlando told CNNMoney that devices exist to pull the data off smartphones, then hack into it. Matt Blaze, one of the nation’s top encryption experts, told members of the committee that breaking into an encrypted phone is a cinch. It’ll take 10,000 tries to get past a four-digit passcode. “On modern computing hardware, essentially no time at all,” Blaze said. Seconds maybe. Still, some law enforcement officials remain opposed to this level of personal privacy. Dan Conley, the top state prosecutor in Boston, criticized Apple. U.S. Representative Ted Lieu, a Democrat from California, wan’t having it. There’s another reason to keep phones encrypted: If the FBI can get in, so can hackers. That’s an often misunderstood notion about security: Encryption isn’t a dial. It’s more like an on/off switch. It either works (by keeping everyone out) or it doesn’t.